The Dante Quartet continue their award-winning exploration of the French string quartet with this disc which includes two of the greatest works of this genre. Both quartets dazzled and disturbed at their first performances. Debussy’s fantastic, spiralling variations, resisting orthodox ‘development’ of ideas, is described as reminiscent of Monet’s in recording the variations of light on the façade of Rouen Cathedral. Traditionalist commentators were shocked, but the exotic beauty of the writing excited many, including the young Ravel. 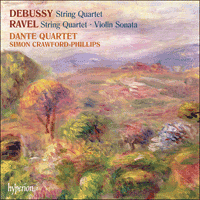 Ravel’s Quartet is to some extent an hommage to Debussy, but, typically, also a work of startling originality. Also included is Ravel’s Violin Sonata No 2 in G major, an intriguing, jazz-influenced work, energetic but with a dark undertow of pain; written, as Ravel said, with the aim of ‘exploring the basic incompatibility of violin and piano’. After the Franco-Prussian War and the horrors of the Commune, there was a determination to show that France was not only free of the invader, but also once again a functioning entity. The foundation of the Société Nationale de Musique in 1871, with the motto ‘Ars Gallica’, was to provide an invaluable platform for the works of younger French composers. But, for whatever reason, amid the welter of French violin sonatas, piano trios and piano quartets written in the 1870s and ’80s, string quartets were in relatively short supply, certainly from the major composers. Possibly intimidated by the ghost of Beethoven, César Franck and Fauré did not venture to write one until they were sixty-eight and seventy-nine respectively (in 1890 and 1924) and for Debussy, and later Ravel, to enter this domain around the age of thirty was to court charges of presumption. Before the first performance of the Debussy Quartet by the Ysaÿe Quartet on 29 December 1893, audiences at the Société Nationale had already heard Debussy’s cantata La damoiselle élue, of which one critic wrote prophetically ‘this subcutaneous injection may possibly produce dangerous eruptions among the young composers of the near future’. The Quartet too was to have a decisive influence, notably on Ravel. Some of the immediate responses from the critics were enthusiastic, but not those of Chausson, with whom Debussy was very friendly at the time. It is clear from a letter Debussy wrote to him on 5 February 1894 that Chausson liked things in the work which Debussy would rather had remained undetected, and that he found Debussy’s forms lacking in decorum: ‘I’ll write another one which will be for you, and I’ll try and bring some nobility to my forms’, responded Debussy, with just a hint of acid. We can only guess as to exactly which parts of the Quartet Chausson objected to: the scherzo perhaps, full of flying pizzicati, and very probably a reminiscence of the gamelan he had heard at the 1889 Exposition; or indeed the very opening of the first movement, where an initially impassioned modal statement simply runs out of steam by the twelfth bar, to be succeeded by an apparently unrelated theme in a quite different mood. Chausson’s view was that Debussy did not roll up his sleeves and really get to work on his material—a similar response to that from Vincent d’Indy, who later told Georges Auric that both the Debussy and Ravel quartets were no more than ‘jolis morceaux pour quatuor à cordes’. But then Debussy always resisted orthodox ‘development’ of his ideas, much preferring to exercise a looser ‘fantaisie’ through free variation, as in the transformations of the Quartet’s opening theme, which itself owes something to Grieg’s first String Quartet, also in G minor. To label these transformations ‘cyclic’, in the manner of Franck, is to miss something of the Debussyan essence. The theme does not, for example, culminate in any grand peroration like the one in Franck’s Symphonic Variations, unkindly dubbed by Alfred Cortot ‘l’embourgeoisement du thème’. Debussy’s approach is nearer to Monet’s in recording the variations of light on the façade of Rouen Cathedral. Contemporary critics noted that in the slow movement the Russian influence was alive and well, and it could be that this whiff of exoticism struck Chausson as unpatriotic. When, in 1905, the thirty-year-old Ravel was excluded by the jury from the final round of the Prix de Rome composing competition, much of the ammunition fired on his behalf in the ensuing ‘affaire’ was propelled by an appreciation of his String Quartet. Its patent mastery of form and technique meant, as one supporter said, that Ravel was honouring the competition by entering. The work had had its first performance a year earlier, on 5 March 1904. Whatever academic failure lay behind him, and indeed in front of him, after this performance he could no longer be written off as just another salon composer. He had ‘arrived’. And it’s worth noting that when a second edition of the score was published in 1910, he changed a few details of the texture but nothing of the substance. In 1904 he could of course still be accused of being a Debussyste, and would be for a number of years yet. The charge, in respect of the Quartet, does carry some weight, not least because the months around its first performance mark the high-water mark of the two composers’ friendship. For a century Debussy has been quoted as begging Ravel not to change a note of the work. The truth, now vouchsafed through the publication of Debussy’s Correspondance, is rather more prosaic, if no less interesting: what Debussy in fact begged was that Ravel shouldn’t ask the players to play more quietly, as he threatened to after the final rehearsal, but should bear in mind that an audience mops up sound—though the viola could be encouraged to be a bit more discreet. The scherzo thrives on the opposition between plucked and bowed sounds and, in the middle section, between steady and fluctuating tempos. If the overall conception owes something to the scherzo of Debussy’s Quartet, Ravel’s full, almost orchestral textures are his own—it seems he saw the medium objectively, uncluttered by any notion of it as the accepted repository of pure inward thoughts. The cello phrase that opens the slow middle section, later taken up by the first violin in octaves, is related to the first four notes of the first movement, but not too obviously so. In the slow movement Ravel manages to integrate into his own language harmonies that owe something to César Franck, and from the start reappearances of the opening phrase from the first movement now proclaim his cyclic intentions more plainly. If these initially sound extraneous to the argument, by the end of the movement Ravel has succeeded in integrating them so that the reference in the final three bars has the force of a conclusive statement. In the finale he shows total assurance in handling the asymmetry of five beats in the bar (possibly deriving from his love of Russian music) and in balancing themes against ostinato patterns. In effect he continues the rhythmic games of the second movement, replacing the 6/8–3/4 contrast with one of 5/8 (5/4)–3/4. The area of 5/8 (5/4) is characterized by the sound of fast repeated notes, while that of 3/4 carries the new versions of the two themes of the first movement. These themes are now less concerned with tension between each other than with counteracting the subversive powers of the quintuple rhythm. The coda compresses the rhythmic struggle, and triple metre wins by a whisker. For both Debussy and Ravel, originality was important: Debussy’s motto was ‘toujours plus loin’ (‘ever further’) and Ravel was fond of exclaiming about his own discoveries that ‘personne n’avait fait ça’ (‘nobody has done that before’). If Ravel’s Quartet is to some extent a homage to Debussy’s, there are enough differences between the two works to make charges of plagiarism untenable. Similarly, whereas a superficial glance at the two men’s violin sonatas of 1923–7 and 1917 reveals a pair of three-movement works in G major, they are in fact concerned with utterly different materials and techniques. In the central ‘Blues’, Ravel gave vent to his enthusiasm for jazz, as in the opera L’enfant et les sortilèges and the two piano concertos. He wanted the opening piano chords to sound like the plucking of metal strings and the instrument to maintain an implacable rhythm, against which the violin can indulge in freer slides and wailings. On his American tour in 1928, he used this movement to try and convince the critics that jazz was the way forward for American music, and couldn’t understand why they insisted in regarding it as unrespectable. Possibly they were aware of the undertow of pain in the movement. If so, the unrelenting finale only confirmed that this was not a typical work of the Silly Twenties. An earlier version of this movement had been more lyrical but, according to Ravel, not right for the work … and so ended in the fire. The American audiences did not know that Ravel was paying them a compliment by way of emulating Edgar Allan Poe, who wrote of the climax to his poem The Raven: ‘Had I been able, in the subsequent composition, to construct more vigorous stanzas, I should, without scruple, have purposely enfeebled them, so as not to interfere with the climacteric effect.’ Are beauty and truth synonymous, as Keats maintained? Or can energy and virtuosity be enough? Whatever the answer, for Ravel, as for us, the apparently effortless confidence of the String Quartet must have seemed a long way in the past. Après la guerre de 1870 et les horreurs de la Commune, la France était déterminée à montrer qu’elle était non seulement libérée de l’envahisseur, mais qu’elle était aussi à nouveau une entité opérationnelle. La fondation de la Société nationale de musique en 1871, avec la devise «Ars Gallica», allait fournir un tremplin inestimable aux œuvres des jeunes compositeurs français. Mais, pour une raison ou une autre, au milieu du déferlement de sonates pour violon et piano, de trios avec piano et de quatuors avec piano français écrits dans les années 1870 et 1880, les quatuors à cordes ont été relativement peu nombreux, émanant certes des plus grands compositeurs. Peut-être intimidés par le fantôme de Beethoven, César Franck et Gabriel Fauré ne se sont risqués à en écrire un qu’à l’âge de soixante-huit et de soixante-dix-neuf ans respectivement (en 1890 et 1924); et en ce qui concerne Debussy et plus tard Ravel, en abordant ce domaine à la trentaine, ils s’exposaient à se voir reprocher leur audace. Avant la première exécution du Quatuor à cordes de Debussy par le Quatuor Ysaÿe le 29 décembre 1893, les auditeurs de la Société nationale avaient déjà entendu la cantate La damoiselle élue de Debussy, dont un critique a écrit prophétiquement: «Cette injection sous-cutanée pourrait bien produire des éruptions dangereuses chez les petits jeunes gens à venir.» Le Quatuor aussi allait exercer une influence décisive, notamment sur Ravel. Certaines réactions immédiates des critiques furent enthousiastes, mais pas celle de Chausson, avec qui Debussy était très lié à l’époque. Il ressort clairement d’une lettre que lui a adressée Debussy le 5 février 1894 que Chausson aimait dans cette œuvre des choses que Debussy aurait préféré laisser dans l’ombre, et qu’il trouvait que les formes de Debussy manquaient de bienséance: «J’en ferai un autre qui sera pour vous … et j’essayerai d’anoblir mes formes!», a répondu Debussy, juste un peu caustique. On ne peut faire que des suppositions quant aux parties exactes du Quatuor qui ont suscité les objections de Chausson: le scherzo peut-être, plein de pizzicatos rapides et très probablement une réminiscence du gamelan qu’il avait entendu à l’Exposition de 1889; ou en fait le tout début du premier mouvement, où une exposition modale initialement passionnée s’essouffle simplement à la douzième mesure, suivie d’un thème apparemment sans rapport dans une atmosphère tout à fait différente. Chausson pensait que Debussy n’avait pas retroussé ses manches pour travailler vraiment ce matériel—une réponse analogue à celle de Vincent d’Indy, qui a dit plus tard à Georges Auric que les quatuors de Debussy et de Ravel n’étaient rien de plus que de «jolis morceaux pour quatuor à cordes». Mais Debussy a toujours résisté au «développement» orthodoxe de ses idées, préférant de loin faire preuve d’une «fantaisie» plus détachée au travers de variations libres, comme dans les transformations du thème initial du Quatuor, qui doit lui-même quelque chose au Quatuor à cordes n°1 de Grieg, également en sol mineur. Qualifier ces transformations de «cycliques», à la manière de Franck, reviendrait à passer à côté d’un élément de l’essence debussyste. Le thème, par exemple, ne culmine pas dans une grande péroraison comme celui des Variations symphoniques de Franck, durement qualifiée par Alfred Cortot d’«embourgeoisement du thème». L’approche de Debussy est plus proche de celle de Monet, enregistrant les variations de couleurs sur la façade de la cathédrale de Rouen. Les critiques contemporains ont noté que, dans le mouvement lent, l’influence russe était bien vivante et il se pourrait que cette bouffée d’exotisme ait frappé Chausson comme un manque de patriotisme. En 1905, lorsque Ravel, âgé de trente ans, a été exclu par le jury de la dernière épreuve du concours de composition du Prix de Rome, une grande partie de ce qui a plaidé en sa faveur dans «l’affaire» qui s’en est suivie reposait sur une appréciation de son Quatuor à cordes. Sa maîtrise manifeste de la forme et de la technique signifiait, comme l’a souligné l’un de ses partisans, que Ravel honorait le concours en y prenant part. L’œuvre avait été créée un an plus tôt, le 5 mars 1904. Quel que soit l’échec académique qu’il avait derrière lui et aussi devant lui, on ne pouvait plus le considérer après cette exécution comme irrécupérable tel un compositeur de salon supplémentaire. Il était «arrivé». Et il mérite d’être mentionné que lors de la publication d’une seconde édition en 1910, il a modifié quelques détails de la texture mais rien de la substance. En 1904, on pouvait bien sûr toujours l’accuser d’être un debussyste et il allait l’être encore pendant plusieurs années. En ce qui concerne le Quatuor, cette accusation a un certain poids, d’autant que les mois qui ont entouré sa création marquent l’apogée de l’amitié des deux compositeurs. Depuis un siècle, Debussy est cité comme suppliant Ravel de ne pas changer une note de cette œuvre. La vérité, établie aujourd’hui au travers de la publication de la Correspondance de Debussy, est un peu plus prosaïque, mais pas moins intéressante: en fait, ce que Debussy supplie Ravel de faire, c’est de ne pas demander aux instrumentistes de jouer plus calmement, comme il avait menacé de le faire après la dernière répétition, mais qu’il n’oublie pas qu’un auditoire absorbe le son—bien qu’on puisse suggérer à l’alto d’être un peu plus discret. Le scherzo se nourrit de l’opposition entre les sons des cordes jouées pizzicato et ceux des cordes jouées avec l’archet et, dans la section centrale, entre les tempos réguliers et fluctuants. Si la conception d’ensemble doit quelque chose au scherzo du Quatuor de Debussy, les textures pleines, presque orchestrales de Ravel lui sont propres—il semble qu’il ait considéré ce moyen d’expression en toute objectivité, en faisant abstraction de toute notion de cette forme qui en fait le dépositaire reconnu de pures pensées personnelles. La phrase du violoncelle qui commence la section lente centrale, puis est reprise par le premier violon en octaves, est apparentée aux quatre premières notes du premier mouvement, mais de façon pas trop manifeste. Dans le mouvement lent, Ravel réussit à intégrer dans son propre langage des harmonies qui doivent quelque chose à César Franck et, dès le début, des réapparitions de la phrase initiale du premier mouvement affirment maintenant plus ouvertement ses intentions cycliques. Si ces réapparitions semblent tout d’abord sans rapport avec l’argument, à la fin du mouvement Ravel réussit à les intégrer de telle sorte que la référence aux trois dernières mesures a la force d’une exposition conclusive. Dans le finale, il fait preuve d’une assurance totale dans le maniement de l’asymétrie de la mesure à cinq temps (provenant peut-être de son amour de la musique russe) et dans l’équilibrage des thèmes en fonction des motifs ostinato. En effet, il poursuit les jeux rythmiques du deuxième mouvement, remplaçant le contraste 6/8–3/4 par un contraste 5/8 (5/4)–3/4. La zone à 5/8 (5/4) se caractérise par le son de notes rapides répétées, alors que celle à 3/4 comporte les nouvelles versions des deux thèmes du premier mouvement. Ces thèmes sont alors moins concernés par la tension entre chacun d’entre eux que par l’équilibrage des pouvoirs subversifs du rythme à cinq temps. La coda comprime la lutte rythmique et le rythme ternaire l’emporte de justesse. Pour Debussy et Ravel, l’originalité était importante: Debussy avait pour devise «toujours plus loin» et Ravel adorait s’exclamer à propos de ses propres découvertes que «personne n’avait fait ça». Si, dans une certaine mesure, le Quatuor de Ravel est un hommage à celui de Debussy, les deux œuvres sont assez différentes l’une de l’autre pour que les accusations de plagiat soient indéfendables. De même, alors qu’un coup d’œil superficiel aux sonates pour violon et piano composées respectivement en 1923–27 et 1917 par les deux hommes révèle deux œuvres en sol majeur en trois mouvements, elles reposent en fait sur des matériels et des techniques complètement différents. Dans le «Blues» central, Ravel a donné libre cours à son enthousiasme pour le jazz, comme dans l’opéra L’enfant et les sortilèges et les deux concertos pour piano. Il a voulu que les premiers accords du piano ressemblent au pincement de cordes métalliques et que l’instrument conserve un rythme implacable, le violon pouvant se livrer pendant ce temps-là à des glissandos plus libres et à des sons plaintifs. Au cours de sa tournée américaine en 1928, il a utilisé ce mouvement pour essayer de convaincre les critiques de ce que le jazz était la voie à suivre pour faire avancer la musique américaine et il ne comprenait pas pourquoi ils considéraient avec insistance que ce n’était pas une musique respectable. Ils avaient peut-être conscience de la tension douloureuse dans le mouvement. Si c’est le cas, le finale implacable n’a fait que confirmer que ce n’était pas une œuvre typique des années folles. Une version antérieure de ce mouvement, plus lyrique mais, selon Ravel, pas bonne pour cette œuvre … a donc terminé au feu. Les auditeurs américains ne savaient pas que Ravel leur faisait un compliment à la manière d’Edgar Allan Poe, qui a écrit à propos du point culminant de son poème The Raven («Le Corbeau»): «Si j’avais pu, dans la composition suivante, construire des strophes plus vigoureuses, je les aurais affaiblies intentionnellement, sans le moindre scrupule, afin de ne pas toucher à l’effet du point crucial». La beauté et la vérité sont-elles synonymes, comme le soutenait Keats? ou l’énergie et la virtuosité peuvent-elles suffire? Quelle que soit la réponse, pour Ravel, comme pour nous, l’assurance apparemment naturelle du Quatuor à cordes devait paraître relever d’un univers bien lointain. Nach dem Deutsch-Französischen Krieg und den Schrecken der Pariser Kommune wollte man in Frankreich nicht nur demonstrieren, dass der Eindringling vertrieben sondern auch, dass das Land wieder eine funktionierende Einheit war. 1871 wurde die Société Nationale de Musique 1871 gegründet und mit dem Motto „Ars Gallica“ sollte sie ein Forum von unschätzbarem Wert für die Werke der jüngeren französischen Komponisten werden. Aus welchen Gründen auch immer entstanden jedoch in den 70er und 80er Jahren des 19. Jahrhunderts im Gegensatz zu den zahlreichen französischen Violinsonaten, Klaviertrios und Klavierquartetten kaum Streichquartette; zumindest scheinen die großen Komponisten sich mit diesem Genre nicht so sehr auseinandergesetzt zu haben. César Franck und Fauré wagten sich erst im Alter von 68 beziehungsweise 79 Jahren (1890 und 1924) an das Streichquartett heran—möglicherweise waren sie von dem Geist Beethovens eingeschüchtert. Dass Debussy und später auch Ravel sich bereits im Alter von etwa 30 Jahren sich dieser Gattung annahmen, trug ihnen den Vorwurf der Überheblichkeit ein. Vor der ersten Aufführung des Quartetts von Debussy, die von dem Ysaÿe Quartett am 29. Dezember 1893 gegeben wurde, hatte das Publikum der Société Nationale bereits Debussys Kantate La damoiselle élue zu Gehör bekommen, wozu sich ein Kritiker mit der folgenden Prophezeiung äußerte: „Diese subkutane Injektion könnte bei den jungen Nachwuchskünstlern durchaus zu gefährlichen Ausbrüchen führen.“ Das Quartett selbst sollte ebenfalls entscheidenden Einfluss ausüben, insbesondere auf Ravel. Einige Kritiker reagierten spontan begeistert auf das Werk, nicht jedoch Chausson, mit dem Debussy zu der Zeit eng befreundet war. Aus einem Brief von Debussy an Chausson vom 5. Februar 1894 geht hervor, dass Chausson an dem Werk gewisse Elemente gefielen, die Debussy lieber unbemerkt gewusst hätte, und dass er fand, dass es Debussys Formen an Dekorum mangelte: „Ich werde noch eines extra für Sie komponieren … und ich werde mich darum bemühen, meine Formen edler zu gestalten!“, schrieb Debussy, leicht säuerlich. Man kann nur darüber spekulieren, welche Teile des Quartetts genau Chausson missfielen: möglicherweise das Scherzo, das voller fliegender Pizzicati ist und sicherlich auf das Gamelan-Orchester anspielt, das er bei der Pariser Weltausstellung 1889 erlebt hatte. Vielleicht war es auch der Anfang des ersten Satzes, wo eine zunächst leidenschaftliche modale Figur im 12. Takt an Antrieb verliert und dann von einem offenbar unverbundenen Thema mit einer völlig anderen Stimmung abgelöst wird. Chausson war der Ansicht, dass Debussy sich nicht sorgfältig genug mit seinem Material auseinandergesetzt hatte—eine ähnliche Reaktion wie die von Vincent d’Indy, der später zu Georges Auric sagte, dass die Quartette von Debussy und Ravel nicht mehr seien als „jolis morceaux pour quatuor à cordes“ („hübsche Stückchen für Streichquartett“). Doch Debussy sträubte sich stets gegen orthodoxe „Durchführungen“ seiner Ideen und zog es stattdessen vor, seine Werke mithilfe von freien Variationen loser und fantasieartiger anzulegen, so wie die Transformationen im Anfangsthema des Quartetts, das dem ersten Streichquartett von Grieg, das ebenfalls in g-Moll steht, nicht unähnlich ist. Bezeichnete man diese Transformationen als „zyklisch“ (wie bei Franck), so würde man ein wichtiges Element des Debussy’schen Stils übergehen. So findet das Thema zum Beispiel keinen Höhepunkt in einer großartigen Zusammenfassung, wie es in den Symphonischen Variationen von Franck passiert, die Alfred Cortot etwas boshaft als „l’embourgeoisement du thème“ bezeichnete. Debussys Ansatz ähnelt mehr dem Stil von Monet und dessen Studien des Lichteinfalls auf die Fassade der Kathedrale zu Rouen. Zeitgenössische Kritiker stellten fest, dass der russische Einfluss im langsamen Satz deutlich zum Ausdruck käme, und es könnte durchaus sein, dass Chausson diesen Hauch von Exotismus als unpatriotisch bewertete. Als der dreißigjährige Ravel 1905 von der Jury des Prix de Rome von der Endrunde ausgeschlossen wurde, gab es einen Skandal, bei dem seine Anhänger hauptsächlich durch die Bewunderung für sein Streichquartett angefeuert wurden. Ein Befürworter meinte, es sei aufgrund der offenkundig meisterlichen Anlage und Technik des Werks vielmehr eine Ehre für den Wettbewerb, dass Ravel daran teilgenommen hätte. Das Quartett war ein Jahr zuvor am 5. März 1904 erstmals aufgeführt worden. Welcher Fehler Ravel nun auch immer unterlaufen war, beziehungsweise unterlaufen sollte—nach dieser Aufführung konnte er nicht mehr als ein bloßer Salon-Komponist abgetan werden. Er war „angekommen“ und es ist interessant festzustellen, dass er für die zweite Auflage, die 1910 herauskam, zwar einige Details umarbeitete, die Substanz des Werks jedoch nicht veränderte. 1904 konnte ihm natürlich noch zu Recht nachgesagt werden, dass er ein Debussy-Anhänger war, was sich auch in den darauffolgenden Jahren nicht ändern sollte. In Hinsicht auf das Quartett ist dies von einiger Relevanz, nicht zuletzt weil in den Monaten um die Uraufführung herum die Freundschaft zwischen den beiden Komponisten ihren Höhepunkt erreichte. Ein Jahrhundert lang kursierte das Gerücht, dass Debussy Ravel angeblich angefleht hatte, nicht eine Note des Quartetts umzuändern. Durch die Veröffentlichung von Debussys Correspondance hat sich jedoch kürzlich herausgestellt, dass diese Begebenheit etwas prosaischer, wenn auch nicht weniger interessant war: tatsächlich bat Debussy Ravel inständig darum, die Musiker nicht leiser spielen zu lassen, wie er es nach der letzten Probe angedroht hatte, sondern er möge in Betracht ziehen, dass ein Publikum klangschluckend wirkt—obwohl die Bratsche durchaus dazu ermutigt werden könne, etwas diskreter zu spielen. Ravel tat seinen individuellen Ansatz bei diesem Medium von Anfang an kund. Die etwas eigenartig anmutende, statische Atmosphäre zu Anfang muss einige ältere Zuhörer vor den Kopf gestoßen haben, die an dieser Stelle in einem Sonatensatz größere Bestimmtheit gewohnt waren. Die erfrischenden Triolen des zweiten Themas kamen für eben jene Zuhörer sicherlich nicht zu früh. Doch das Intervall der fallenden Quarte und die aufsteigenden Basslinie des ersten Themas sind charakteristische Merkmale bei Ravel und beide Elemente sorgen für eine gewisse Einheit innerhalb des Werks, ebenso wie seine Vorliebe für modale Harmonien und Umrisse. Alle vier Sätze beginnen mit dem Ton A, der die Tonika F-Dur mit d-Moll und a-Moll verbindet; die orthodoxe Dominante C-Dur taucht jedoch während des gesamten Stückes kaum auf. Der erste Satz ist gemäß der traditionellen Sonatenform angelegt und hat eine friedliche Coda, kann jedoch (in Bezug auf seine Texturen) auch anders interpretiert werden: der Komponist Gerard McBurney beschrieb ihn als ein Spiel mit Paaren, „wie bei einem Volkstanz, wo man sich mit jedem Musikabschnitt zum nächsten Tanzpartner bewegt und nie genau weiß, wessen Hand man bei den nächsten Takten halten wird“. Das Scherzo gedeiht dank der Gegenüberstellung von gezupften und gestrichenen Tönen und—im Mittelteil—von konstanten und schwankenden Tempi. Wenn die Gesamtanlage sich auf das Scherzo des Quartetts von Debussy bezieht, so sind doch die reichen, fast orchestralen Texturen typisch für Ravel—offenbar betrachtete er das Medium in objektiver Weise und ohne jegliche Vorbelastung, etwa dass es ein Hort der Verinnerlichung sein müsse. Die Cellophrase, mit der der langsame Mittelteil beginnt und die später von der ersten Violine in Oktaven übernommen wird, stammt von den ersten vier Noten des ersten Satzes ab, jedoch nicht in offensichtlicher Weise. Im langsamen Satz gelingt es Ravel, Harmonien mit Anklängen an César Franck in seine eigene Tonsprache zu integrieren und das wiederholte Auftauchen der Eingangsphrase des ersten Satzes von Anfang an verdeutlicht nun seine zyklische Anlage. Auch wenn diese Passagen zunächst keine Beziehung zum Hauptthema zu haben scheinen, so gelingt es Ravel doch, sie im Laufe des Satzes derart zu integrieren, dass sie in den letzten drei Takten ein schlüssiges Ende ergeben. Im Finalsatz beweist er völlige Sicherheit in seiner Behandlung der Asymmetrie, die sich durch fünf Schläge pro Takt ergibt (was möglicherweise durch seine Liebe zur russischen Musik inspiriert worden war), und in der Art und Weise, in der er Themen gegen ostinate Muster setzt. Er setzt hier quasi die rhythmischen Spiele des zweiten Satzes fort und ersetzt dabei den 6/8–3/4-Kontrast mit einer Gegenüberstellung von 5/8 (5/4) und 3/4. Der 5/8 (5/4)-Abschnitt zeichnet sich durch den Klang schneller Tonrepetitionen aus, während im 3/4-Teil neue Versionen der beiden Themen des ersten Satzes erscheinen. Hier betont Ravel weniger die Spannungen zwischen den beiden Themen, sondern mehr die ihnen entgegenwirkenden, umstürzlerischen Fünferrhythmen. In der Coda wird das rhythmische Ringen komprimiert und der Dreiertakt kann sich gerade eben durchsetzen. Sowohl für Debussy als auch für Ravel war Originalität wichtig: Debussys Motto war „toujours plus loin“ („immer weiter“) und Ravel sagte gern über seine eigenen Entdeckungen, dass „personne n’avait fait ça“ („das hat noch keiner gemacht“). Auch wenn Ravels Quartett in gewisser Weise dem Quartett von Debussy Tribut zollt, so gibt es doch genügend Unterschiede zwischen den beiden Werken, dass ein Plagiatsvorwurf unhaltbar wäre. Und während ein oberflächlicher Blick auf die Violinsonaten der beiden Komponisten von 1923–27, beziehungsweise 1917 zwei dreisätzige Werke in G-Dur offenbart, so geht es doch jeweils um völlig unterschiedliche musikalische Stoffe und Techniken. Im zentralen „Blues“-Teil drückte Ravel seine Begeisterung für den Jazz aus, ebenso wie auch in der Oper L’enfant et les sortilèges und in den beiden Klavierkonzerten. Die Anfangsakkorde des Klaviers sollten wie gezupfte Metallsaiten klingen und das Instrument sollte dabei einen unerbittlichen Rhythmus beibehalten, gegen den freiere Gleit- und Jammerklänge der Violine gesetzt sind. Auf seiner Tournee durch Amerika im Jahre 1928 versuchte er, mit diesem Satz die Kritiker davon zu überzeugen, dass der Jazz die Zukunft für die amerikanische Musik sei und konnte nicht verstehen, warum sie diese Musikform trotzdem auch weiterhin als unanständig betrachteten. Möglicherweise hatten sie den schmerzvollen Sog in dem Satz bemerkt. In dem Falle bestätigte das unerbittliche Finale jedoch, dass es sich hierbei nicht um ein typisches Werk der „albernen Zwanziger“ handelte. Eine frühere Version dieses Satzes war lyrischer angelegt gewesen, doch Ravel zufolge passte dies nicht zum Werk … und so endet er mit Feuer. Man weiß nicht, ob das amerikanische Publikum sich darüber im Klaren war, dass Ravel ihm ein Kompliment machte, indem er sich an Edgar Allan Poe anlehnte, der über den Höhepunkt in seinem Gedicht The Raven („Der Rabe“) schrieb: „Wenn es mir möglich gewesen wäre, in der folgenden Komposition energischere Strophen zu konstruieren, so hätte ich sie skrupellos und absichtlich entkräftet, um den Effekt des Höhepunkts nicht zu behindern.“ Sind Schönheit und Wahrheit gleichbedeutend, wie Keats behauptete? Oder können Energie und Virtuosität genug sein? Wie die Antwort auch lauten mag, für Ravel—und auch für uns—muss die scheinbar mühelose Zuversicht des Streichquartetts weit in der Vergangenheit gelegen haben.